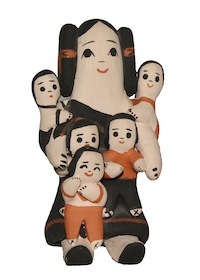 Singing Mothers, a type of storyteller with a woman and a single child, dated back to about 1900 but the first true storytellers appeared in the 1960s in Cochiti Pueblo. After the clay is gathered and tempered, potters use a paddle-and-anvil technique, which is much more effective than the traditional coil method in producing these figures. Individual parts are then pinched, coated with slip, painted and fired, resulting in the lovely figures you see here. There are variations to be found in each Pueblo and each one contributes to this modern and playful art form. At least two well-known artists are represented here: Dorothy Herrara and the Fragua family.